Smile and Wave: Vintage Here, Vintage There: Date Night!! 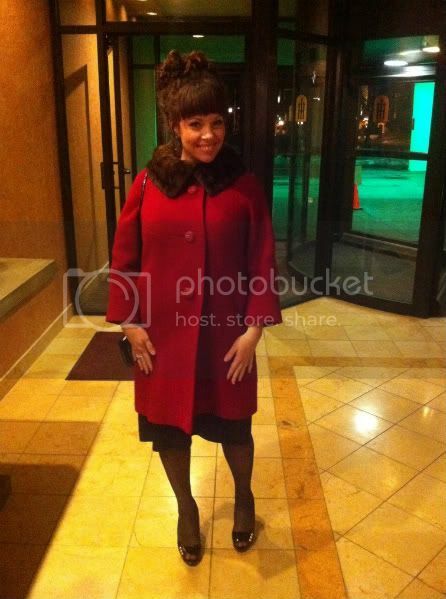 Vintage Here, Vintage There: Date Night!! 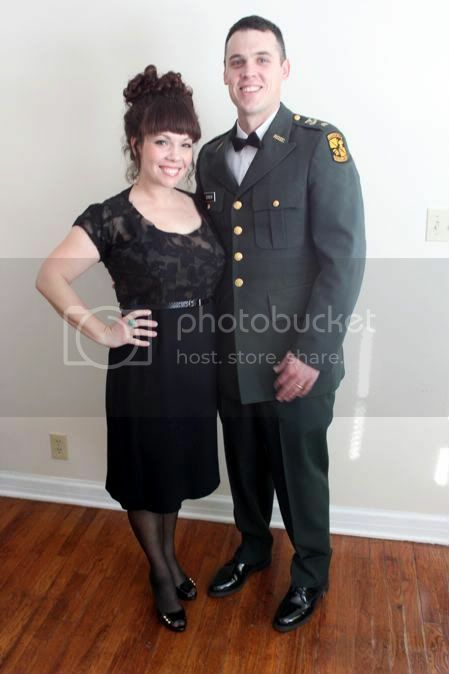 Saturday was the annual military ball! It snuck up on me this year and without a lot of time to shop the mall for a new dress I decided I'd just head to Red Velvet to browse the vintage dresses in hopes of finding something pretty. I tried on so many GORGEOUS mid-century frocks that were either a little snug in the hips, a little too big in the chest, or perfect but not quite formal enough. The one I brought home was cocktail party appropriate but was a little bit large in the shoulders. It must have been worn by a much taller woman in it's day! I hated to change it's silhouette because it's what made this dress so classic! 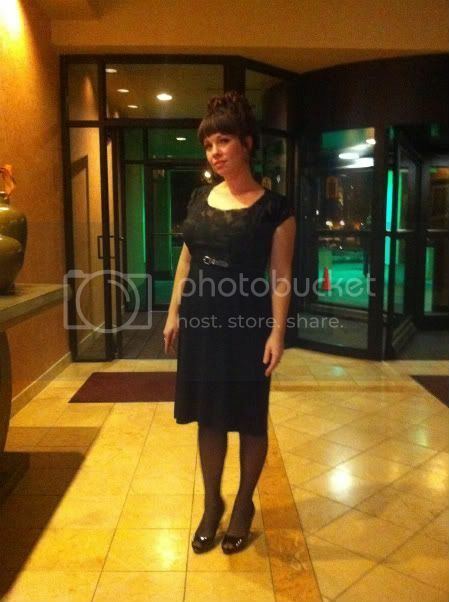 However, I had only a few hours to make something work or have to wear the same dress that I'd worn last year. I reworked the neckline to open it up a little and took in about 1.5" in the shoulders. Then I had to adjust the sleeves ghetto style. In the end, it felt a little more 90's than 60's but it finally fit. Brett and I were running a little late again this year so we only had time to take two pictures before we left. Here we are, much less nervous about what to expect at the ball and if our three month old (at the time) would be okay for at least three hours away from mama! We got to the University Plaza Hotel downtown and visited with another couple a little closer to our ages (um...not 21) during the social hour before the receiving line started. We laughed a lot and heard their stories about deployment and married life. We even had friendly, talkative people at our table this year so the whole night was pretty enjoyable. We ducked out after dinner as we'd already been there for about four hours and really aren't the dancing fools we used to be. Oh wait...nope, we've never been dancing fools unless you count living room dance parties with the kids to Dan Zane! Ha! I asked Brett if I looked like I was going to a funeral. He was a sweetie and said no. I did feel pretty but if I were to do it again, I think I would've gone with something a little more flirty or long and flowy. 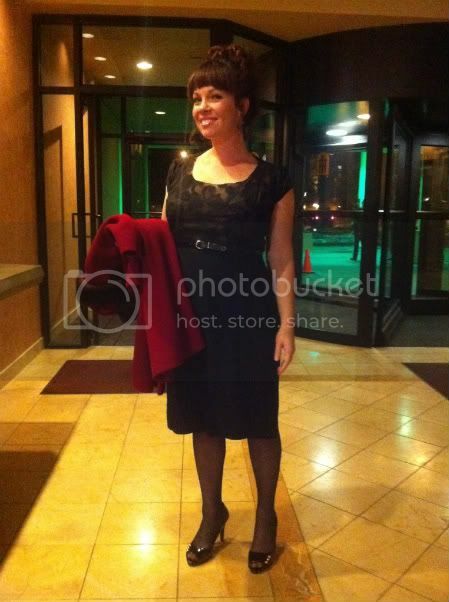 I need to remember to take advantage of those opportunities to dress to the nines! 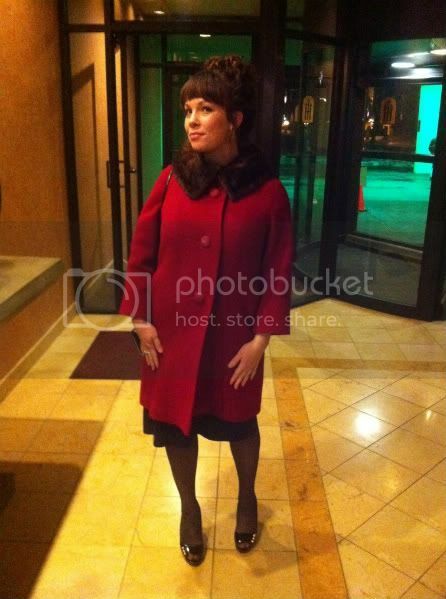 I DID get to wear my new red coat! I thrifted this pretty boucle coat with a fur collar for $3 in town last month. $3!!! I've seen similar coats for $70 - $100 on Etsy and to find one that was more fitted and in such a great color was kind of fantastic. Oh, and you can't see my earrings very well in any of these photos but they are Betsey Johnson. Elsie got them for me two Christmases ago and they are little rhinestone hearts with arrows attached to a chain. Perfect for Valentine's weekend! Date nights are my favorite nights, perfect dress or not. And doesn't Brett look handsome in his uniform! Rubyellen wore a pretty vintage dress this weekend, too! Did you get to wear something pretty this weekend (date night or not)? Girl, you look GREAT, the dress and coat is SUPER wonderful...what a steal! You looked beautiful! That coat is amazing! I love finding deals like that. You look awesome in that dress! you look fabulous! 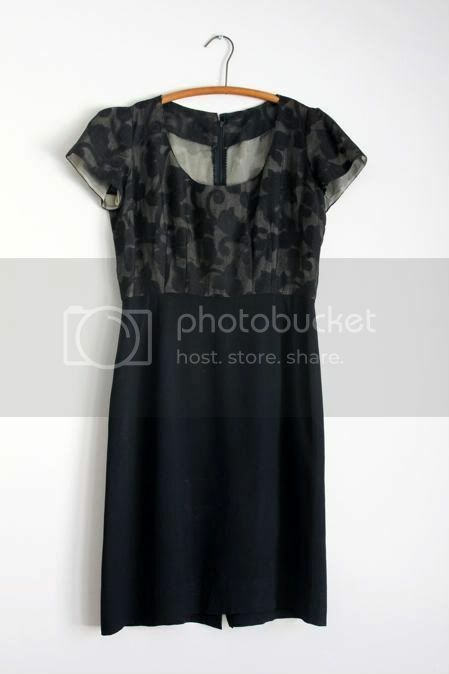 I love how you altered the dress, much more modern and chic. Hope you had a great time! you look fantastic, and that coat is just wow! what a find :) i remember going to balls at university, it was always such a challenge to find something cute, affordable and a little different, i'd have loved for a dress like yours! Rachel, you look beautiful and you did such a great job on that dress too! What a steal your coat was! Fabulous! aww you two are so cute!! and great job on the dress--i love it! My Betsey Johnson earrings are my absolute fave! It looks like you 2 had a nice fun night out! Every time the USMC Birthday Ball rolls around I'm happy because, yay pretty dress stuff and creations, but I do hate being one of the older wives (even if I don't look it). Love the coat by the way. You look superb! I wish I could find such a coat. Date nights are fun huh! It's great to have babies, but also great to have a date night out without them too, i concur! both you look absolutely dashing!!! That dress looks great on you, and I love your coat! Military Balls are the best! 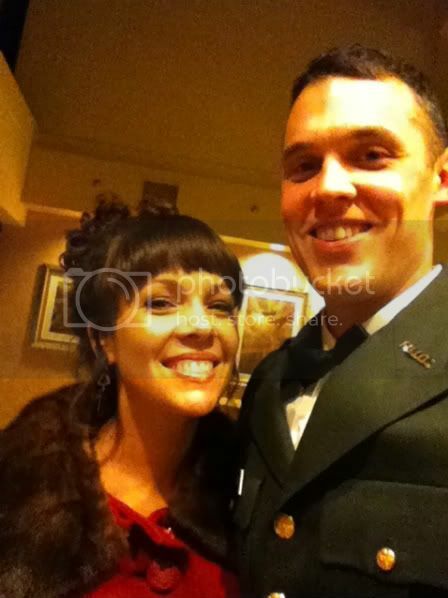 That was my husband's and my first date :) Your dress looks beautiful, I'm glad you all had fun that evening! oh my gosh Rachel you look STUNNING! Mr. Brett is certainly handsome in his uniform as well. Totally cute!! The coat is amazing.